American Retail Supply has a wonderful selection of gift bows. These are an easy and convenient addition to gift wrapping. For some hand making bows out of ribbon is hard. We offer 3 different types of high-quality gift bows and with 100+ options to choose from you are sure to find a gift bow that suits your needs. Anyone can make fancy bows! Perfect gift bows are made of floral satin, available in multiple sizes. Perfect bows arrive flat in a small box, so they take up very little space at your counter and the shipping cost is minimal. These bows come in a box of 50. Easy as pulling a ribbon, you will have a professional looking bow. Curling the remaining two strands of the perfect gift bow adds a finishing touch to your package. Star gift bows are the most common bow found in stores. American Retail Supply offers 21+ colors of star bows. 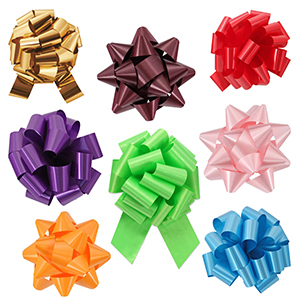 These gift bows are made of a shiny poly ribbon, just peel and stick straight to the present. These bows come in a box of 100, 200 or 300 depending on the size and color. Pre-notched gift bows are another professional looking option. The gift bow is pre-notched in the middle so all you do is pull apart the loops and it makes a professional bow. These gift bows come in a box of 100. Turn your gift into an expression by bringing it to the next level with a gift bow! These bows are suitable for any occasion Christmas, Birthdays, Weddings and all other holidays. Wrapping gifts is some people's favorite things to do during the holidays. It really gets you into the spirit of giving. Making gift baskets this year? Don't forget to finish all your hard work with a beautiful gift bow. It's the extra touches and surprises that really make a gift great. As a retailer you want to provide the best possible service to your customers. Providing a gift wrap service is a great way for customers to remember your extraordinary customer service.